Congratulations from all at NPOC to Andy for winning Car of the Month for December 2004. Let's get straight into the interview with the man of the moment. Well done Andy, as always we'll start with hearing a bit about yourself, let us know who you are and some facts about yourself. "Ok then, my proper name is Andrew Teggert, I'm 25 and I originally hail from Durham. I now live down in sunny Teesside in Norton, Stockton which is a lot closer to my job at the James Cook University Hospital in Middlesbrough. I'm a Senior Biomedical Scientist in the Biochemistry department in charge of the automated general chemistry section. When I tell people this they sometimes look both slightly impressed and very confused! Basically, we do all the biochemical blood analysis for the hospital and the local GPs - as well as the common tests that people might have heard of such as cholesterol and lipids we do things such as tumour markers for monitoring cancer treatments and cardiac markers for helping to diagnosis heart problems. When I'm not working I am usually messing around with either the car or my guitars. Unfortunately spare time is at a bit of a premium since I'm also doing a part time Masters which is fairly demanding, people keep telling me it'll all be worth it in the end! I?m a life long Newcastle United supporter, which makes for some interesting conversations when most of your mates at work support Boro! I get on with everybody though, and the nights out are always a good laugh." Thanks Andy, now we can get all the low down on the car of the month. The model you drive is a P11 GTSE, can you give us information on what sort of spec that model comes with and your thoughts on that lovely colour? "There's just a few more goodies chucked in on top of the usual GT spec. 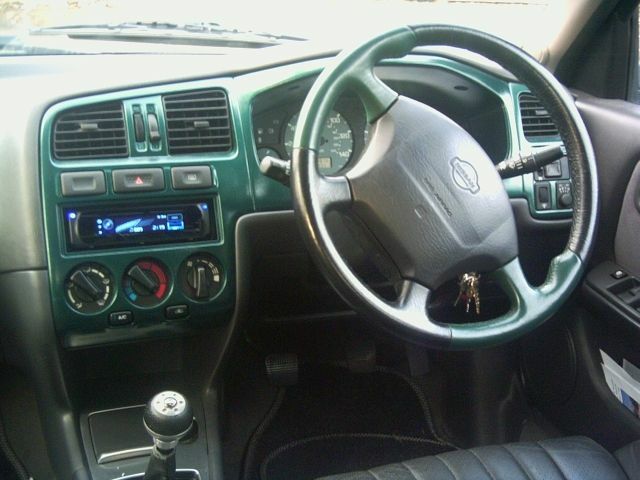 The car has a full leather interior with funky green piping, Momo gear knob, electric windows all round, GTSE 16" alloys (when I got it) and of course, the chromoflair/mystic paint. 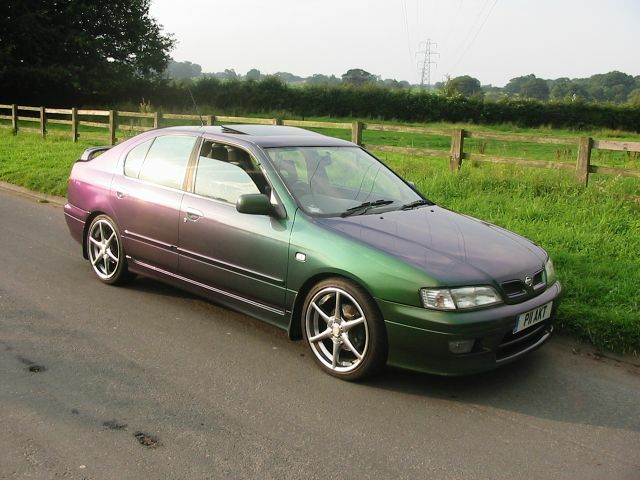 In the past I've heard people refer to the Primera as being uninspiring but I think that's b*ll*cks when you consider that Nissan had the balls to throw on possibly the most original paint job they could! The paint is obviously what makes the car a little different. People have come up to me in the street and asked how much it cost - they can't seem to believe it when I tell them it rolled out of the factory like that!" We know you had a P10 before, how did you discover Primeras and what brought you to NPOC originally? "My best mates dad used to work for Nissan and he was quite high up in the company. Consequently, he always used to have various Nissans kicking around as company cars, mostly Primeras and Terranos. He sometimes managed to get hold of quite rare models and at one point years ago he had a four wheel drive SGX, which I think was the only one in the country. I don?t know what happened to that particular car, but I've never heard of any others since! So anyway, my mate was insured through his dads company insurance to drive whichever car was in his possession at the time. So if his dad had a brand new eGT at the time, we used to get to go flying around in that! You can imagine how cool we felt aged 17 cruising around in an eGT!!! My awareness of Primeras and how good they could be was therefore instilled at me at an age when I was most impressionable about cars! No surprise then when I ended up with a P10 1.6 LX a few years later. NPOC came to my attention when I was searching the web for some info on the car, I think I came across some of the cars on CarDomain, I specifically remember seeing Andy?s page on EvoGT and I think there was a link there to NPOC. 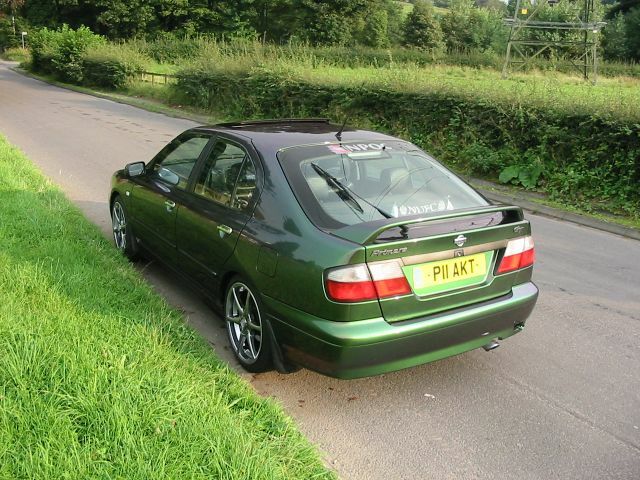 Incidentally, I remember when originally setting up my CarDomain page for my P10 there were only about 17 entries for the Primera, go have a look at how many there are now!" When you changed from your P10, were you looking for a mystic specifically or did this one just catch your eye? "The initial decision was to upgrade to a GT, however I was aware of the mystic and its a car that I've always thought I'd liked to own and one just happened to be for sale when I went shopping! I don't think I would have searched specifically for one if this one wasn't available but as luck would have it this one was! The car was for sale in a little place called Swineshead, Lincs. Me and my bro travelled down one Saturday and prowled around it for about an hour and a half, took it for a test drive then looked it over again! We drove back and I thought about it all Saturday night, then I phoned to garage the on Sunday and put down the deposit. When I went to pick it up a few days later the bloke who owned the a garage told me that since I'd put the deposit down he'd had five serious enquiries about the car, so I just got in there in time! I had to get the train down to Grantham, where Carl (Icycalm) picked me up and we trundled to the garage in his old Panda! After picking the car up I met Si (Pandamedic) at Donington Park before heading back up the M1." It's certainly a fantastic looking car. It's not standard though is it, can you tell us what modifications you have made to the car? "One of the things people notice first about the car (after the colour!) are the wheels. 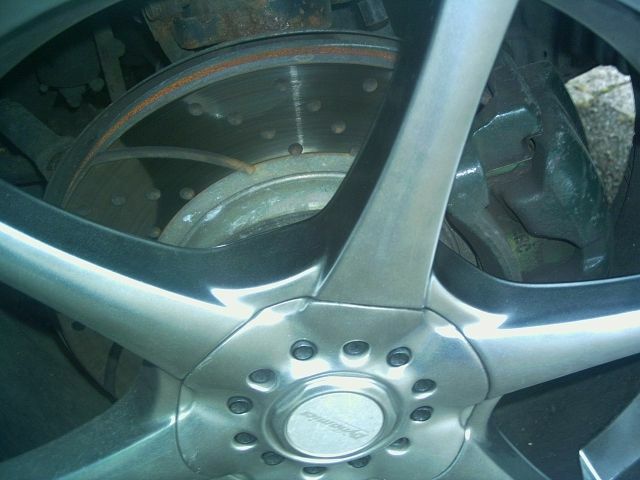 The alloys are 18" Team Dynamics K2s, wrapped in 215/40/18 Falkens. 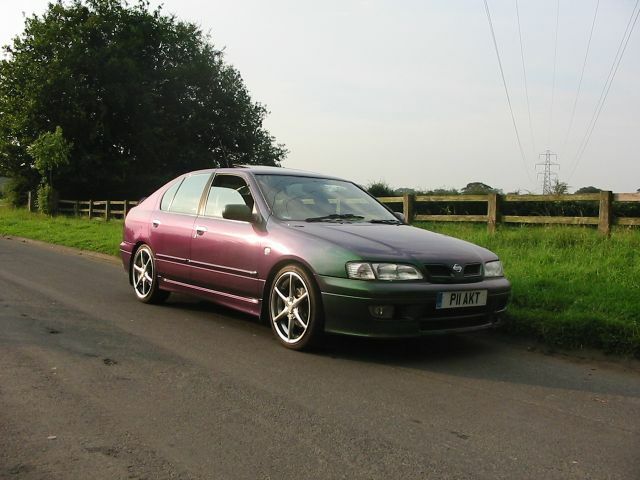 These alloys were originally on the Skymera, then Kev S. sold them to Kev F, and I bought them from Mick after Kev F. did a part-ex for Micks 19s! The front brakes have been upgraded to EBC discs and Green stuff pads and the suspension all round now consists of KYB AGX adjustable shocks and Eibach springs (Cheers to Kev M aka Phat Gadgy!). With the combination of the 18s and the lowering I've set the suspension to fully soft. 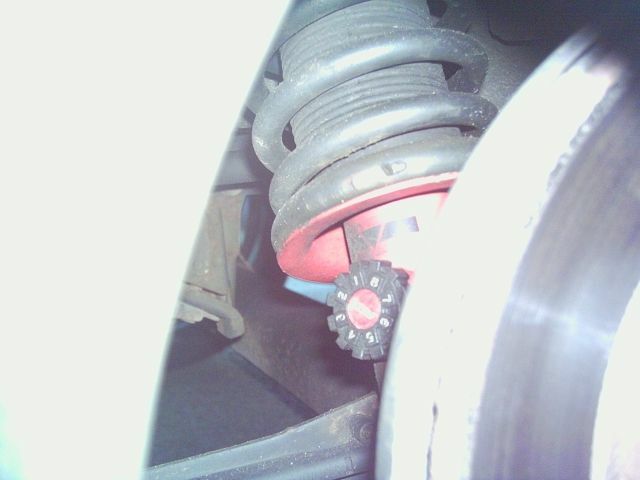 The great thing about the KYB shocks is that they're fully adjustable on the car, in the not too good quality photo of the rear shock you can see the adjustment knob. A quick turn and your done! There's a K&N 57i filter stuck under the bonnet.Externally, I've added a set of clear R34 side repeaters, clear rear clusters (cheers Steve! ), private plate and meshed the passenger side fog. I did this as the lens smashed and I'm not willing to pay the price for a new fog! This is shown in the pic, car was dirty that day, just completed a 400 mile round trip! The only thing I've done to the interior is to replace the centre console and dash surround with one that I sprayed in British racing green. 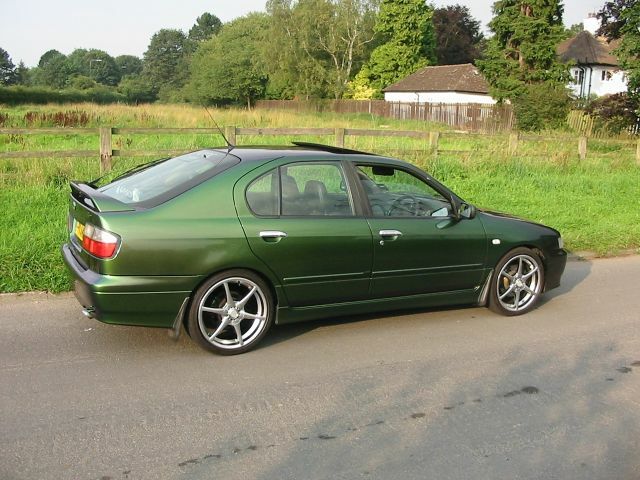 When I bought the car there was a wood effect surround fitted." We hear that you like your tunes too, any audio changes in the car? Soundstream SPL12 DVC 10" sub powered by a Vibe VP-4. Up until recently I was using an old skool Rockford 2212 DVC sub that was rated at 1000wRMS. Unfortunately, the cone started come away from the surround and rather than go to the expense of re-coning it I though I'd use it as an excuse to get something else! The Soundstream, despite only being a 10" sub can drop very low and really kicks. I'm on the look out for another one of these, but it's an older series and not too common so I'll have to do a bit of searching. I've got a set of RF Fanatic Q components to replace the Alpines, a job that is on my to-do list, which is about a mile long! I actually surprised myself with the choice of headunit. Generally, Sony stuff is rated as far as car audio goes and with regards to things as subs and amps I'd agree. However, the headunit has three sets of 4V preamp outputs, MP3 capability, remote control and a motorised flip front with active screen so it looks proper bo!" Bet it rocks!! What?s your driving style Andy, do you push the GT to its limits? "Generally I would say I drive carefully and within my own limits, there's too many other idiots on the road without me adding to the problem! However, I do occasionally like to open the car up when I know it's safe to do so. There's a good stretch of road on the way down here from Durham that's got nice bends that really bring out the excellent handing characteristic of the car. And I think it doesn't do the car too much harm to bounce it off the red line now and again! One of the things I like about the GT is its understated status. There's quite a bit of power available and I'm sure a lot of GT owners have surprised other drivers when the needle gets to about 4.5k!" What does the future hold in store for your car, any modifications that you have in the pipelines that you can disclose? "There are a few things that I want to get done, when I eventually manage to secure a few days off work! I've got a nice shiny rocker cover and SS Autochrome header to be fitted along with a Powerflow Catback system I've had for a while, bought from some rudeboy whose name escapes me (escaped me too but he's a top dude! SC). 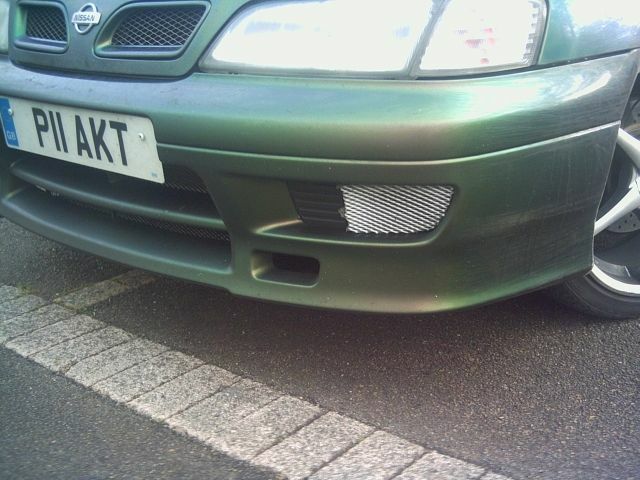 There's also a CAI on the way and I've got an underbody lighting kit to be cracking on with." Another great winner and another great CotM, our last winner in 2004. All that remains for me to say is well done to Andy from everyone at NPOC and you may now make your speeches!! "Cheers to everyone who I've bought stuff from, whose collected, transported and hung on to bits for me, got drunk with etc!!! Big up to the Mods for holding everything together and well done to every member for making NPOC what it is!"